We started the planning for a new playground on August 1, 2016. The insurance company informed us that all but one piece of the current playground equipment needed to be removed. We established a plan, a budget and a contract with GameTime Play Systems, which was presented to the town counsel on November 7, 2016. 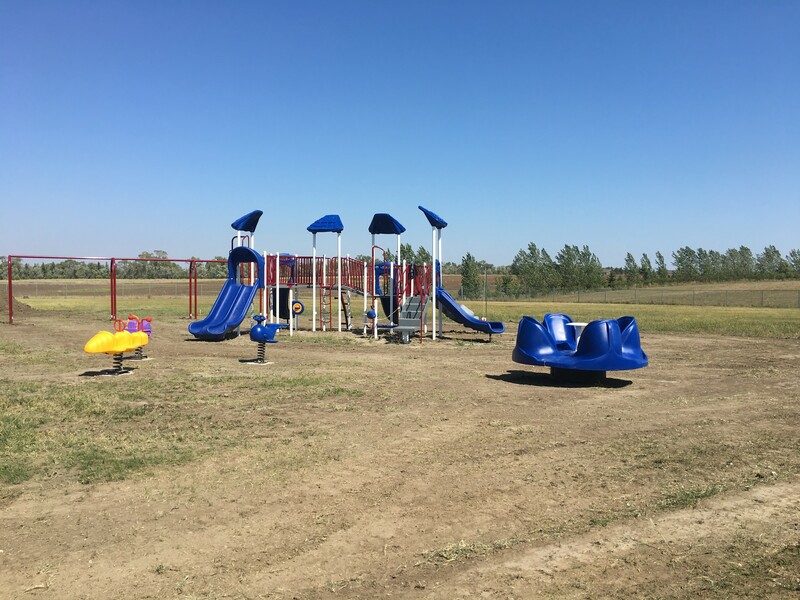 We spent 2017-2018 raising money and applying for grants to help with the purchase of the playground equipment. We took out a loan with Union State Bank of Hazen in November 2017 (repaid March 2018) and August 2018 (repaid November 2018), which allowed us to fulfill our contract with GameTime and purchase the engineered fiber. We have raised all of the money needed to complete our project. We started installing the new playground in the evenings and weekends this summer. The new playground is now located in the old baseball diamond. The picture below is our current state (October 10, 2018). We had to reschedule the installation of the engineered fiber, edging and weed barrier for spring due to weather conditions. We will communicate our plans for completing the park in the spring of 2019.